The following families have genealogy eBooks on this page: Adams, Barber, Carpenter, Drummond, Edwards, Eliot, Fogg or Fogge, Gardiner, Hale, Kingsbury, Light, Meyer, Normandeau, Oldfather, Ricks, and Shepherd families. Welcome to Bookshelf 15 at Hawkeyes Trading Post! "A people which takes no pride in the noble achievements of remote ancestors will never achieve anything worthy to be remembered with pride by remote descendants." - Macauley. Adams Family History and Genealogy. PDF eBook English Language 4.34 MB Year 1861. It is legend that the family came from Chester, England shortly after 1680 to the American Colonies. 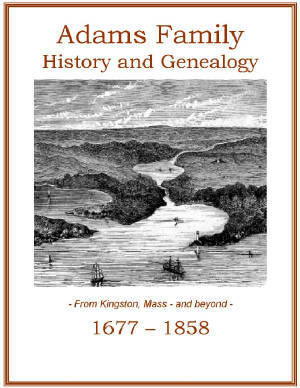 This eBook contains 7 generations of Adams kindred from the first couple that settled in Kingston, Massachusetts, and spans their descendants for a period of over 180 years, from 1677 up to 1858. An index of 300 names accompanies this notable publication of one of Americans accomplished Colonial families! Price $6.95 USD. 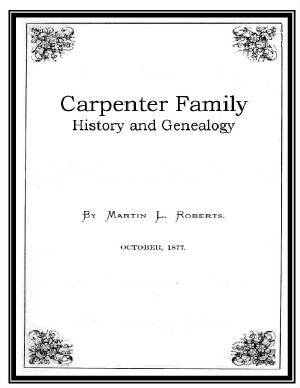 Carpenter Family History and Genealogy. PDF eBook English Language 608 KB Year 1877. William Carpenter came to the American Colonies aboard the ship Bevis in 1638 as an indentured servant. After laboring to pay off his passage he became a freeman in 1640. 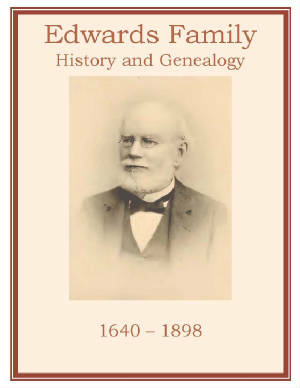 This eBook contains 8 pages of his descendants with vital dates that range from Williams birth in 1576 to the year 1877. A brief account, which may be a unique source for identifying location, and dates, of Carpenter kindred up to the year 1877! Price $6.95 USD. 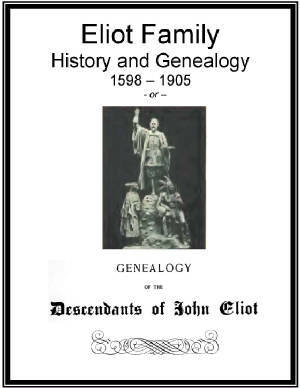 Eliot Family History and Genealogy or Descendants of John Eliot. PDF eBook English Language 14.1 MB Year 1905. The Eliot family extends from Bennett and Letteye (nee Aggar) in Wedford, County of Hertford, England, in 1598. All of their children migrated to the American Colonies, with one onboard the ship Lyon on September 16th of 1632. This eBook contains many rare family etchings, photographs, short stories with legends, descendant publications, monument inscriptions, and a 40 page index listing over 3,000 names of Eliot descendants, in-laws, and relations. An inspiring, well crafted history of one of Americas early colonial families! Price $6.95 USD. Gardiner Family History and Genealogy or The Descendants of George Gardiner. PDF eBook English Language 18.2 MB Year 1919. 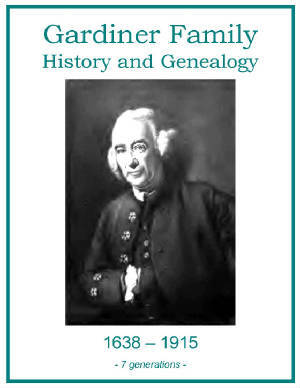 An fascinating account of the Colonist George Gardiner, which includes family accomplishments of his descendants, short biographies, many stories, and 7 generations that extend from the year 1638 up to the year 1915. Over 275 years! There is also a 27 page index that lists over 3,000 names for the family genealogist! An excellent genealogy of one of Colonial Americas early families! Price $6.95 USD. Kingsbury Family History and Genealogy. PDF eBook English Language 14.4 MB Year 1901. Joseph Kingsbury arrived in the American Colonies in 1628. Like many others, he was an indentured servant for 13 years to pay off the passage aboard ship. He became a freeman in 1641. There are 10 generations in this publication spanning the years from 1628 up to 1900. Many rare photographs, etchings, silhouettes, and a 12 page index listing over a 1000 descendants. Also, an additional 22 page index listing in-laws and related families! A great genealogy resource! Price $6.95 USD. 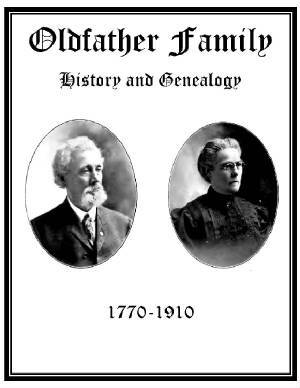 Meyer Family History and Genealogy PDF eBook English Language 5.83 MB Year 1890. This notable account of the Meyer family provides a historical sketch of the family in Pennsylvania since arriving in 1733. The family roots are well engrained in German soil. Vital dates of descendants here in America range from the year 1745 up to 1889. 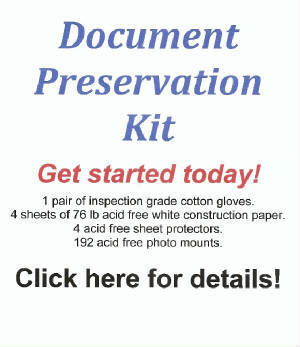 Over 140 years of kindred documentation for the Meyer family genealogist! Price $6.95 USD. 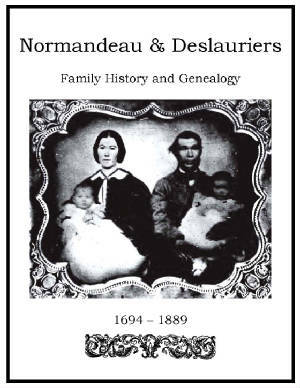 Normandeau and Deslauriers Family History and Genealogy or Genealogy of the Family Normandeau dit Deslauriers. PDF eBook English Language 4.17 MB Year 1894. An abundance of family history is provided which includes: rare ancestral photographs, baptism, marriage, and interment certificates. The vital dates in this publication span the years from 1694 up to 1889. A period of nearly 200 years! A wealth of genealogy for the family historian! Price $6.95 USD. Ricks Family History and Genealogy. PDF eBook English Language 10.3 MB Year 1908. 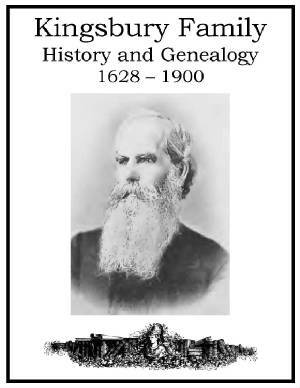 The Ricks family genealogy spans the years from 1638 up to 1907, with a 14 page index listing over 500 descendants and in-laws. The family origin has a legend dating back to 1525 in Norfork County, England in this excellent tribute to the families legacy. The family crest is depicted along with over a dozen rare ancestral photographs! This is an excellent resource for the family genealogist! Price $6.95 USD. 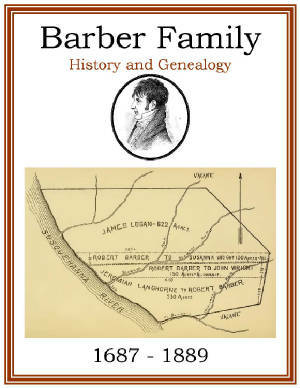 Barber Family History and Genealogy or The descendants of Robert Barber of Lancaster County, Pennsylvania. PDF eBook English Language 9.25 MB Year 1890. Robert Barber was a member of the Society of Friends, and a Cordwainer by trade. He departed Yorkshire, England to Chester, Pennsylvania in the late 1600s. This eBook contains full text of will, extract of memoirs, ancestral letters, and a 12 page index containing over 1,200 names of descendants and in-laws. Vital dates for Barber family descendants extend from the year 1687 up to 1889. A great source of family genealogy for the Barber family! Price $6.95 USD. Drummond Family History and Genealogy or Genealogy of the Noble and Ancient House of Drummond. PDF eBook English Language 14.8 MB Year 1889. A detailed and fascinating account with Drummond family legend dating before the year 1062 with roots to Scotland. From the ancient original manuscript the author catalogs the names of the chief heads of the Drummond Clan, provides the Family Crest, many letters verbatim from the 1600s, and a 14 page index containing over 750 ancient ancestors. 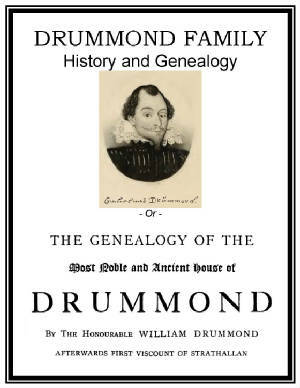 There is so much more in this intriguing account of the Drummond family, that anyone with the surname of Drummond interested in genealogy will certainly find this an outstanding resource! Price $6.95 USD. Edwards Family History and Genealogy or Descendants of Timothy and Rhoda (nee Ogden) Edwards. PDF eBook English Language 8.85 MB Year 1903. Numerous rare ancestral photographs are contained in this publication, which includes vital dates from the year 1640 up to 1898! Over 250 years! A 19 page index also provides the genealogist with over 1,500 descendants with in-laws! An excellent resource for the Edwards family genealogist! Price $6.95 USD. 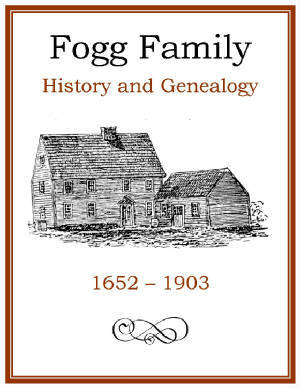 Fogg (Fogge) Family History and Genealogy or Descendants of Samuel Fogge. PDF eBook English Language 2.97 MB Year 1903. The Fogge family legend goes back in England to the year 1112 with this fascinating eBook! Primarily the descendants of Samuel Fogge are listed with vital dates ranging from the year 1652 up to 1903. A period of over 250 years! Verbatim will of Samuel Fogge of 1671, many short biographies, and interesting brief stories as the family spread across the new American Colonies. Up to 9 generations are listed! 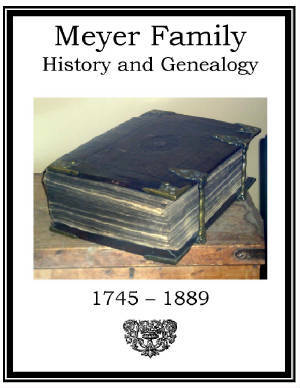 A treasure of genealogy for any Fogg or Fogge family member! Price $6.95 USD. Hale Family History and Genealogy or Descendants of Thomas Hale. PDF eBook English Language 17.8 MB Year 1889. Thomas and Thomasine Hale were in Newbury, Massachusetts in 1638. Their descendants spread across the colonies and the United States over the next 240 years. This publication contains a Last Will and Testament, Letters from mid 1600s, and vital dates on descendants that range ver 240 years, from 1638 to 1886! There is a 22 page index containing over 1,200 names of descendants and in-laws! A great genealogy of one of Americas early colonial families, that was saved before the old ink faded off the pages! Price $6.95 USD. 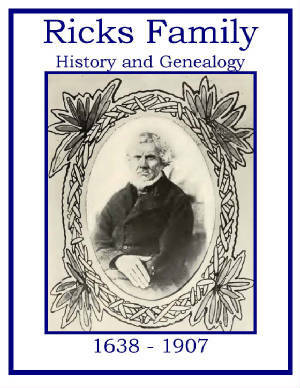 Light Family History and Genealogy PDF eBook English Language 1.87 MB Year 1896. This eBook follows John Light who left Palatinate, Germany about 1749 and headed to Lancaster County, Pennsylvania. Over the next 150 years his descendants spread across the Midwest. The text is faded with time yet is clear to describe the 8 generations with vital dates that range from 1742 up to 1893. 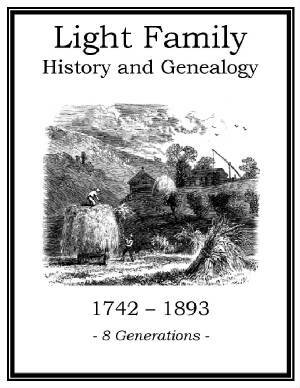 An excellent resource for the Light family genealogist! Price $6.95 USD. Oldfather Family History and Genealogy. PDF eBook English Language 9.66 MB Year 1911. 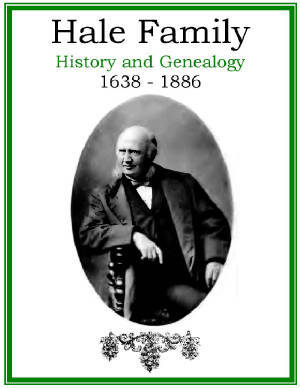 Over 125 rare ancestral photographs, a 33 page index listing 2,500 descendants and in-laws, with vital dates ranging from 1770 to 1910! Over 130 years of genealogical information! Some text has faded with time, but is certainly still readable. A great resource for the family genealogist! Price $6.95 USD. 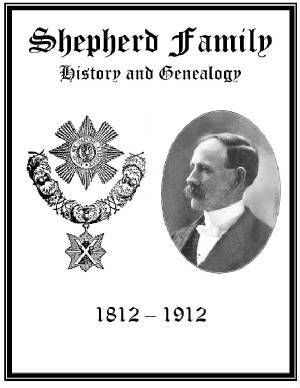 Shepherd Family History and Genealogy. PDF eBook English 5.40 MB Year 1912. This publication traces the Shepherd family origins back into Scottish history to the year 1680. Then the family of James and Sara Shepherd in the American Colonies is detailed along with their descendants. There are over 30 rare ancestral photographs with vital records dating from 1812 to 1912. Many earlier dates are reported which will certainly benefit Shepherd genealogical research. Price $6.95 USD.